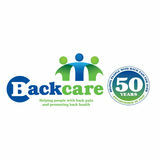 New hope for people who Neck pain is the fourth largest cause of disability worldwide and two out of three of us will suffer with it at some point in our lives.1,2 A recent randomised clinical trial has shown that two forms of complementary healthcare, lessons in the Alexander Technique and acupuncture, can each provide real benefit. The new study, called ATLAS, is published in the November issue of the prestigious Annals of Internal Medicine. 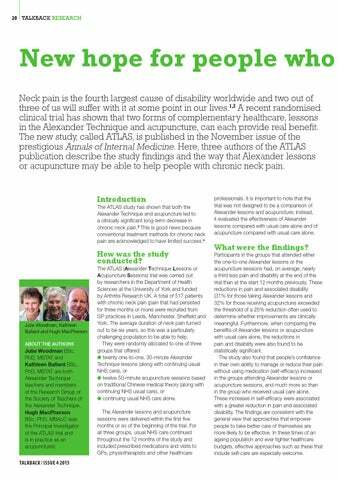 Here, three authors of the ATLAS publication describe the study findings and the way that Alexander lessons or acupuncture may be able to help people with chronic neck pain. Julia Woodman BSc, PhD, MSTAT and Kathleen Ballard BSc, PhD, MSTAT are both Alexander Technique teachers and members of the Research Group of the Society of Teachers of the Alexander Technique. Hugh MacPherson BSc, PhD, MBAcC was the Principal Investigator of the ATLAS trial and is in practice as an acupuncturist. professionals. It is important to note that the trial was not designed to be a comparison of Alexander lessons and acupuncture; instead, it evaluated the effectiveness of Alexander lessons compared with usual care alone and of acupuncture compared with usual care alone. Participants in the groups that attended either the one-to-one Alexander lessons or the acupuncture sessions had, on average, nearly a third less pain and disability at the end of the trial than at the start 12 months previously. These reductions in pain and associated disability (31% for those taking Alexander lessons and 32% for those receiving acupuncture) exceeded the threshold of a 25% reduction often used to determine whether improvements are clinically meaningful. Furthermore, when comparing the benefits of Alexander lessons or acupuncture with usual care alone, the reductions in pain and disability were also found to be statistically significant. The study also found that peopleâ&#x20AC;&#x2122;s confidence in their own ability to manage or reduce their pain without using medication (self-efficacy) increased in the groups attending Alexander lessons or acupuncture sessions, and much more so than in the group who received usual care alone. These increases in self-efficacy were associated with a greater reduction in pain and associated disability. The findings are consistent with the general view that approaches that empower people to take better care of themselves are more likely to be effective. In these times of an ageing population and ever tighter healthcare budgets, effective approaches such as these that include self-care are especially welcome.